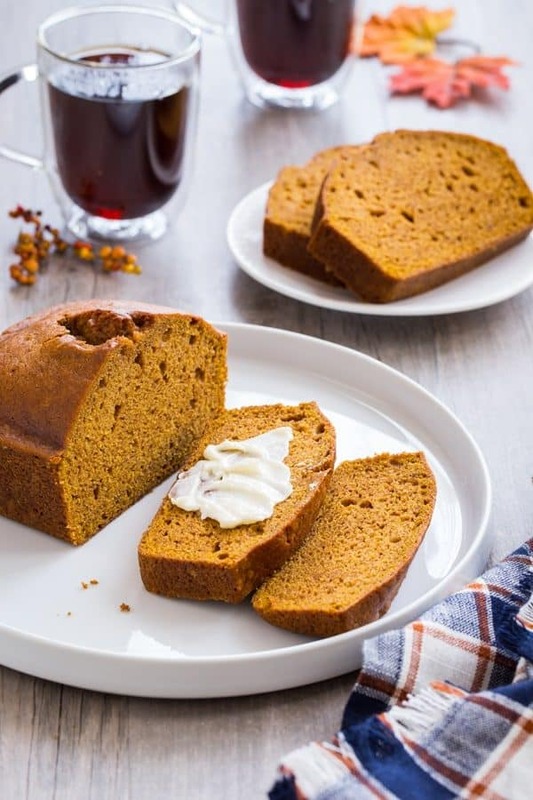 Pumpkin Bread is loaded with warm spices and full of delicious pumpkin flavor. This recipe will become one of your absolute favorites!. Hello, there! It’s been a little while since I posted last here on My Baking Addiction and I totally miss you guys. I wish my time away was due to some exotic vacation, but it was mainly because I was nursing a knee injury after falling off of my porch (I was totally sober btw) while trying to water a fern. And then I got hit with an epic sinus situation that lasted well over a week. Fun times over here. And now here we are at the end of August. My little babe is headed off to preschool soon and I’m ready to make allthepumpkinthings for you. Starting with this pumpkin bread. 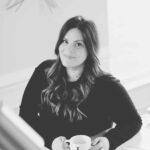 If you’ve been following my blog for years, you know that fall is my fave, so I’ve been over here counting down the days until September. Because September means it’s time to bust out the fall decor, light up the Leaves candle from Bath and Body Works, and start publishing fall recipes for you. Which basically means every pumpkin dessert you can imagine. Please don’t tell me it’s too soon. It’s only 63 degrees here today, I have leaves all over my backyard, and I’m wearing a long sleeved shirt. It’s TIME. 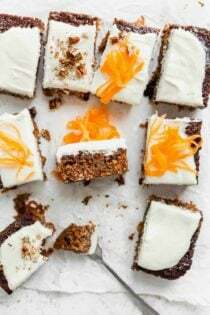 This pumpkin bread has been on my blog for what seems like forever, but the pictures and text were a little outdated, so I thought I’d freshen them up for you! 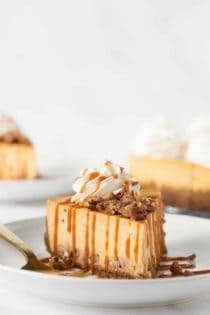 Every year it’s one of the most popular recipes on My Baking Addiction along with my homemade pumpkin pie spice, pumpkin roll and pumpkin crunch cake. Notice a theme here? If you love fall baking as much as I do, get in the kitchen and whip up a triple batch of the pumpkin pie spice recipe, store it in an airtight jar, and you’ll have your own spice blend for every pumpkin recipe you whip up from now until December. Okay, let’s chat about this pumpkin bread. There is nothing that signifies fall for me more than this recipe. I’ve been making it for years – long before my blog and it shows up countless times in my kitchen throughout the season. It’s sweet, spicy and incredibly moist. I know, I know, moist is not my favorite word either, but there is really no way to adequately describe this Pumpkin Bread recipe without mentioning that word. 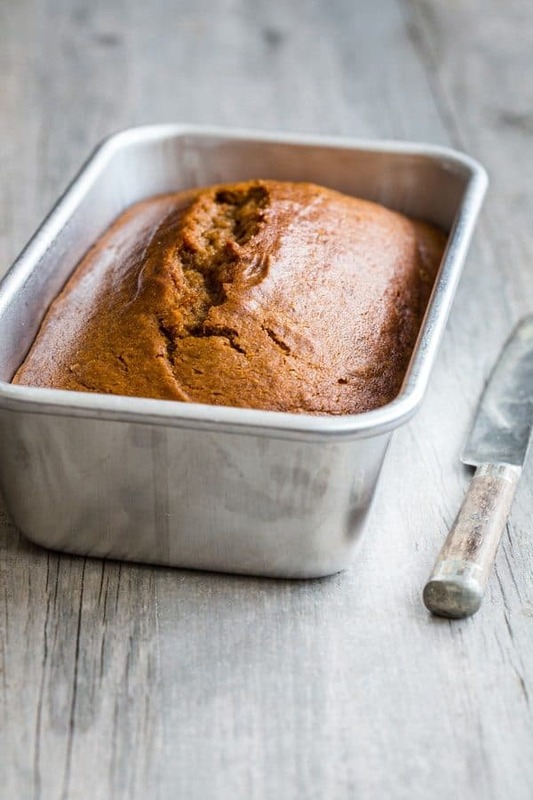 Pumpkin Bread gets better with time, so whip it up a day or so in advance before you plan on eating it or giving it. Because let me tell you, it makes a great gift for neighbors, a hostess gift, or a gift for your boss if you’re looking to butter them up a bit. 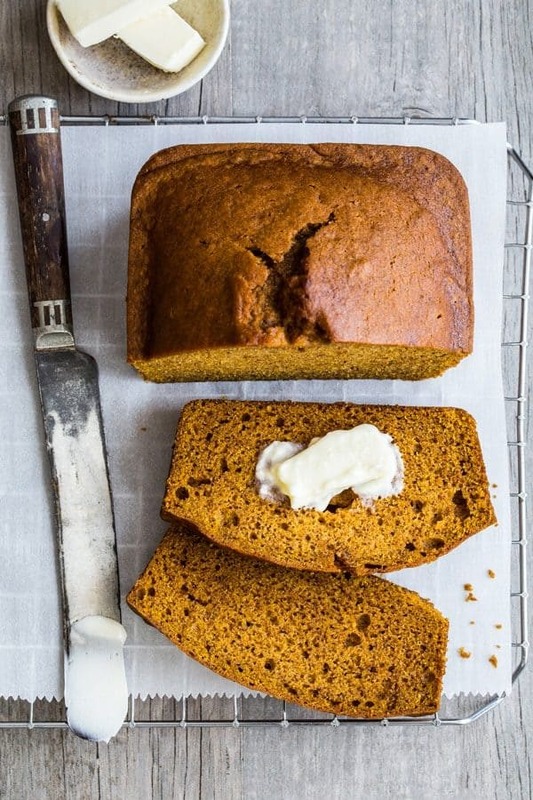 This is a seriously easy pumpkin bread recipe. 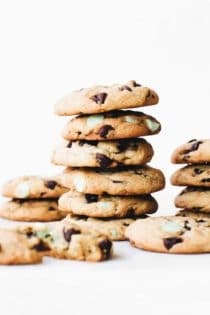 It takes a bit of time to bake, but I bet you can pull together the batter in about the same amount of time it’ll take for the oven to preheat. Like all quick-bread recipes, we mix together the wet ingredients in one bowl, which in this case includes a whole can of pumpkin puree. Make sure to use pumpkin puree, not pumpkin pie filling! In another, we’ll whisk together our dry ingredients. From there, we’ll mix the two together before dividing into prepared loaf pans. If you want to add any extras, like chopped pecans, dried cranberries or even chocolate chips, simply fold them in before you add the batter to the load pans. 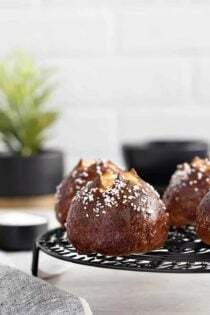 This Pumpkin Bread recipe make 2 loaves, so you could always keep one loaf for yourself and gift the other to a friend or neighbor, or take it as a hostess gift at Thanksgiving. Or you could keep them both for yourself. It freezes beautifully, after all. Serve it up plain, toasted, with a spread of butter, or get a little adventurous, fry it up in a pan, and serve it up French toast style! If you love pumpkin bread, but are looking for pumpkin muffins? This recipe works beautifully for both. Simply divide the batter into muffin into muffin tins that are either sprayed with non-stick cooking spray or lined with paper liners. Bake them up at 350°F for about 18-20 minutes and you’ll have some seriously delicious pumpkin muffins! If you love pumpkin paired with chocolate, feel free to add in about 1 1/2 cups of chocolate chips to the batter to make Pumpkin Chocolate Chip bread! Preheat oven to 350°F. Grease and flour two 8.5 x 4 x 2.5 inch loaf pans. 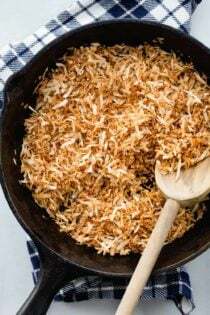 In the bowl of a stand mixer fitted with the paddle attachment or in a large bowl with an electric mixer, combine pumpkin, eggs, oil, water, vanilla and sugar until well blended. In a large bowl, whisk together the flour, baking soda, salt, and pumpkin pie spice until combined. Stir the dry ingredients into the pumpkin mixture until just blended. Pour batter into the prepared pans. Bake in preheated oven for 60-70 minutes or until a toothpick inserted in the center comes out clean. This bread is a fantastic base for all sorts of additions. Get creative by adding in chopped nuts, chocolate chips, dried cranberries or whatever else sounds good to you. Hi, Yvonne! Pumpkin Puree is unsweetened pumpkin, whereas pumpkin butter has sugar and other flavors. I would think the pumpkin butter wouldn’t hold up like the pumpkin puree. Let me know if I can do anything else for you! This bread is fantastic. 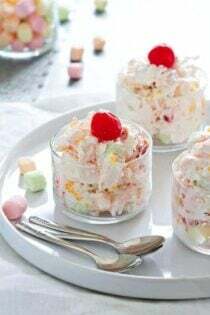 I was given this same recipe in 1970 and have been making it ever since. I add one cup each of nuts ad raisins and bake it in 4 coffee cans. It has a wonderful taste and makes a lovely gift presentation when wrapped in festive clear wrap or in little printed plastic bags. 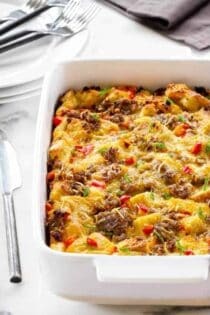 This will be my new go to recipe! It is spring and my boys who are 3 and 6 could eat pumpkin bread all year. One will ask for it for lunch instead of a sandwich. I am glad that the recipe makes two breads. After only being out of the oven for an hour, half of the first loaf is already gone! I’m so glad to hear that! I love pumpkin all year, too! Thanks for the recipe – I love it! Does the oil help hold the bread together? Just wondering why so much oil..
Hi, Jen! The oil adds a lot of moisture to the bread. You could probably substitute two sticks of butter, but I really love the texture the oil gives. Let me know if I can answer any thing else for you! Thanks for this recipe! I ran out of baking powder and had some fresh pumpkin pure that I wanted to use without baking power, so yours was perfect! Since I have fresh pumpkin puree, how much should I use? what is the equivalent to 15 ounces? 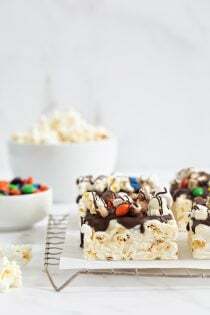 Thanks for posting, I’m looking forward to making this tonight! I’m not 100% certain on the fresh pumpkin puree as it typically has a higher water content than the puree from the can. If you give it a try, definitely let me know how it goes. I just tasted this bread. Delicious! I found the substitution online for 15 ounces of canned pumpkin as compared to my 1 3/4 cups fresh pumpkin puree. I found that someone posted the following substitution on your site so i’ll try it the next time. I like the taste of the oil, but I want to try it with less oil. I think I’ll try half coconut oil for a healthy fat and the other half apple sauce. Thanks again! quoted “I did the substitution when I made this bread today (replaced the oil with 1/2 c. butter + 1/2 cup applesauce). It’s great! Thanks so much for stopping by. So glad to hear it was delicious with the butter and applesauce! I’ll have to give it a try. Hi, Magda! You can let the bread rest for about 10 minutes before removing. I hope you like it! This was delicious! It makes 2 loaves, so we got plenty. Thank you! You’re so welcome, Amy! I’m really glad you liked it! Hi, Kim! The bundt pan will probably be a little big for the batter in the loaf pans. You could use a square baking pan (8 inch or 9 inch). Let me know if I can help you with anything else! What can you substitute the flour with? Hi, Leighann! Can you give me some more information so I can answer your question? Do you need the bread to be gluten free, perhaps? Just let me know, and I’ll try and help! Hi. 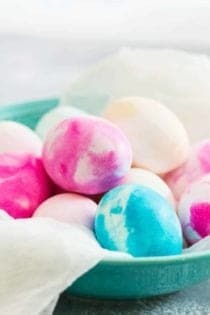 Can you tell me if I can substitute the eggs with some other ingredient? Hi, Prachi! You can substitute 1/4 cup of applesauce or 1 mashed banana for each egg. I hope you enjoy the pumpkin bread! 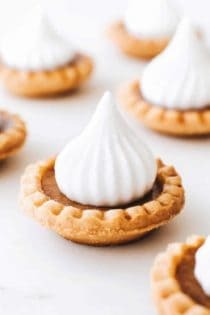 Hi, I want to use mini loaf pans, how long do you recommend baking for? Hi, Rhonda! You’ll probably get four mini loaves from this recipe. Bake for about 35 minutes and check to see if they’re done. Let me know how it goes! True, Hazel! I hope you liked the taste! I agree with you about the pumpkin I also just love it I buy as much of it as possible. I make cookies, whoopie pies, bread, muffins, and pie of course. 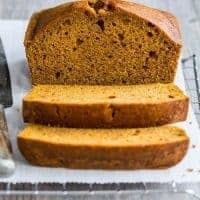 This is the best pumpkin bread I have ever had! Made it 3 times already :-) My Dad, husband and children rave about it. The recipe makes a ton and it does stay moist forever…or at least as long as it has lasted in my house which is 1 to 2 days. Thanks for this recipe! You’re very welcome, Melissa. I’m glad everyone liked it. this bread looks perfect … thinkingi might have to add some chocolate chips too! yum! Thanks so much, Marti! Chocolate chips are soooo good in this bread! This cake is very good. 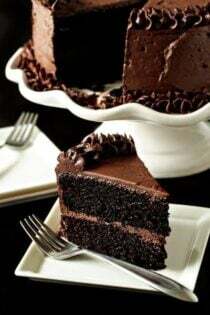 Soft and aromatic, you can enjoy the cake with 1 cup hot milk for the cold day then that’s the great thing. This has been my favorite recipe since I found it a couple years ago from you! Thanks for sharing again. Can’t wait for fall! So glad you love it, Nancy! I am testing it as muffins (with cinnamon chips right now) and I’m hoping they are perfect! How can I receive a copy of your pumpkin bread recipe? Hello! 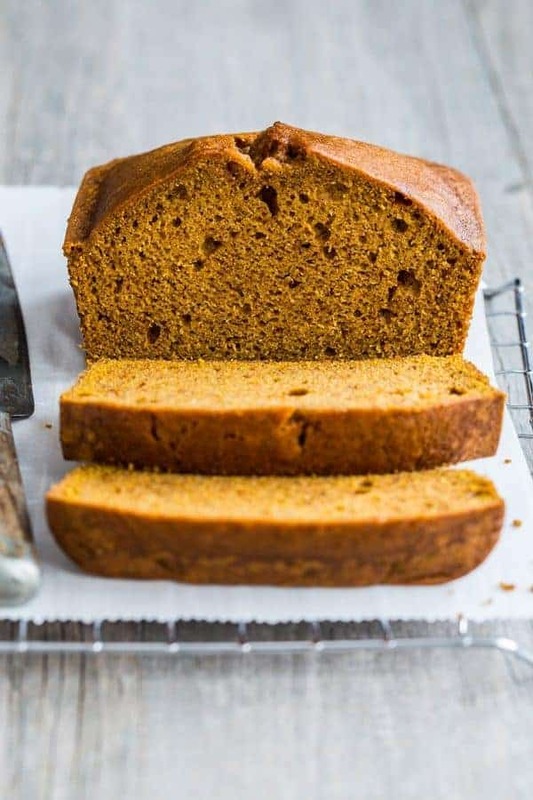 You can’t print a copy of the recipe by clicking here: https://www.mybakingaddiction.com/pumpkin-bread-recipe/print/ – thanks so much for stopping by! Another great recipe Jamie! I used 1/2 cup less of sugar and applesauce to replace a 1/3 of a cup of the oil. And still so moist! My son ate more than half of a loaf right after dinner and the neighbors we had over for dinner also loved it. I will be making a bigger batch of your pumpkin pie spice for the season. It’s much better than what I get at the store and I didn’t even have really good cinnamon for it. Thanks so much for stopping by and leaving your feedback. You can definitely cut back on the oil/sugar and still get a great result. So happy this turned out so well for you! Thank you! I always wonder the same thing. For Pete’s sake, the internet is full of other recipes. Make this one or move on. Since I’m venting, questions such as “can I use … ” crack me up. If you can’t tell the difference between pumpkin butter and pumpkin puree, I don’t think you should be baking. At. All. LOL. By the way, I have made at least 6 different pumpkin bread recipes, and this one is the best. Makes two GOOD sized loaves! Thank you! I really don’t like the pumpkin but this is something looks very interesting. I really want to adopt this recipe at least once. Thanks for sharing it with us. It doesn’t taste pumpkin-y. It does taste pumpkin pie-y, though. And pumpkin is so good for you! I made this and it was perfect! I baked in 3 small disposable baking pans and put golden raisins in it. It is really the best recipe for pumpkin bread I have ever tried! Thank you! So happy to hear you enjoyed the pumpkin bread, Colleen! Thanks for stopping by an leaving your feedback! Definitely 3 loaves using the pan size indicated. But still needed the same amount of time in the oven. Thanks. I am so happy you finally found it! It really needed an update, so we finally got around to it! Happy fall! Simply delicious. Studded mine with mini chocolate chips. Amazing! I love this idea, Vicki! Thanks so much for sharing. Happy baking. This is so delicious!! My kitchen smelled like yummy pumpkin awesomeness too. 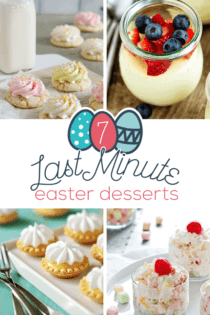 It does’t really need anything else as it is so good all on its own, but to make it more like a dessert, I cut it up into little squares with a dollop of vanilla frosting and put in paper cups…gobbled up up by kids and adults. So happy to hear you enjoyed the recipe Diane! Thanks for stopping back to leave your feedback – your serving idea sounds amazing! Happy baking! I subbed half the oil with applesauce, used buttermilk in place of the water, and cut the amount of sugar in half ….. and it was really quite delicious!!! This time I added chopped pecans and I think next time I will try chocolate chips. Oh, and I was a little concerned about the size of the loaves and the cooking time after reading other comments, but the batter easily fit in 2 loaf pans and they were very much cooked through at 60 minutes. In fact, next time I will check them at 50 minutes next time. This is definitely a keeper! So happy to hear you enjoyed it! Thanks for noting your substitutions, I’ll have to give them a try sometime soon! My husband and I have become addicted to this pumpkin bread. Delicious! I made it into muffins tonight and it worked great! Keep the great recipes coming! It is totally addictive. I make it year round because we love it so much! Thanks so much for stopping by and leaving your feedback! First time maker. Added walnuts and chocolate chips made 2 large loaves! Was a hit at both parties used. Great recipe and planning to make again for thanksgiving. Thank you! Happy holidays! So happy to hear you enjoyed the pumpkin bread, Debby! I’m making a few more loaves this week! Happy holidays to you and yours! 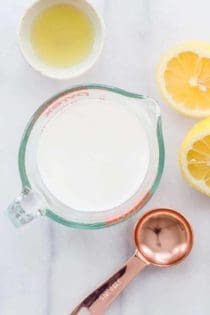 Can yeast and lemon/lime juice work in place of baking soda if I’m making this recipe? I have not attempted this recipe with this substitution, so am unsure how it will perform. Happy holidays to you and yours! So happy to hear you love the recipe so much, Trisha! Thanks so much for stopping by and leaving your feedback. Just made this recipe, threw some pistachios on it and threw it in the oven. Took a little longer than I expected to bake but once it came out it was absolutely perfect! I’ll be taking a few slices for a co-worker and her sister and then eating my way through the rest of the loaf! Bless you!!!!! So happy you enjoyed it, Will! Thanks for stopping by and leaving your feedback! Happy Baking! 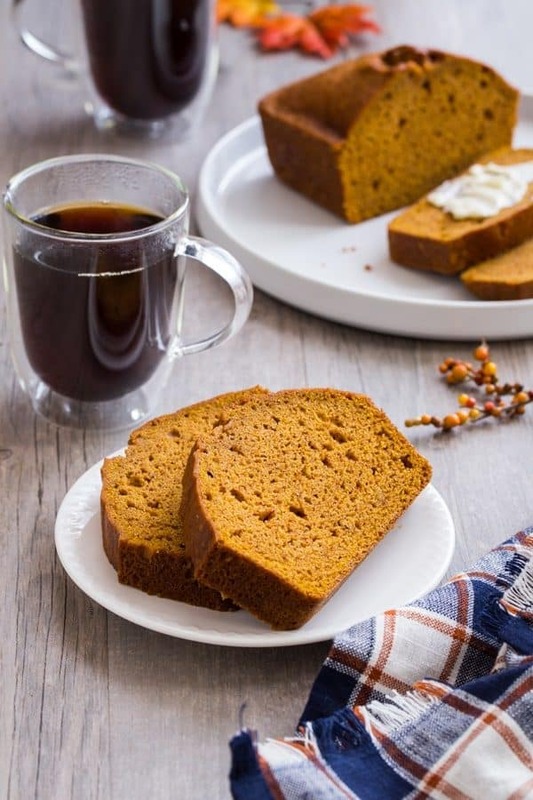 This pumpkin bread recipe is amazing I use it as my base but I add quite a bit more pumpkin spice to it (I am obsessed with pumpkin lol) and I also chocolate chips to one batch and walnuts to another and also just plain! So happy to hear you love the bread, Angelica! Thanks so much for stopping by and leaving your feedback! Omg I admit I hate everything pumpkin, I know I know its a crime. But my son begged me for pumpkin bread becuase he hates the texture of pumpkin pie. So I stumbled upon your recipe and tried it for the first time tonight. Needless to say my 5 year old had 3 slices before bed and asked for 2 in his snack bag for school tomorrow. Needless to say this may become a year round recipe since the husband and mother in law really like it to. Thanks for such an awesome yummy recipe. So happy to hear you and your family enjoyed the bread, Nicole! Thanks so much for stopping by and leaving your feedback! My kitchen smells amazing!! They are in the oven. I added 1/2 cup chopped craisins and 1// cup chopped walnuts. Thinking of a cinnamon drizzle. Not sure yet. I also added 2 tablespoons of applesauce because my oil was a little short. We will see! Can’t wait! Thanks so much for stopping by, Diane! I appreciate you taking the time to comment. Happy Baking! I am new to baking and just found this recipe and I made IN LOVE. I have very little baking expierence and I’m so proud of how good this tastes. It is so moist on the inside! I plan on adding some chocolate chips and pecans next time I make it! So happy to hear you enjoyed the bread, Madi! Thanks so much for stopping by and leaving your feedback! I made this last night as written except I used Hubbard Squash and left out the water, since the squash had such a high water content. It came out wonderful! I’m going to make more tonight and share with my neighbor and in-laws (since I still have half of my smallest squash left). So happy to hear you enjoyed the bread, Tory! Thanks so much for stopping by and leaving your feedback! Thank you for the wonderful pumpkin bread recipe! I made it and everyone loved it. It will be my go-to recipe when I make pumpkin bread. The oil did add texture and moistness to the bread. The spice amount was perfect, though I did cheat and bought the well-known name-brand Pumpkin Pie Spice. I’ll try your spice recipe next time. Thanks!! So happy to hear you enjoyed the bread, June! Thanks so much for stopping by and leaving your feedback! This recipe is perfect. Can I substitute chickpea flour to make it gluten free? I top mine with a sprinkle of- brown sugar, flour, cinnamon, butter. mix together making a crumble then sprinkle on top of loaf batter before you start to bake. I add raisins to mine as well. Thanks so much for stopping by, Cheri! I appreciate you taking the time to comment. Happy Baking! Made this last night for my running club. They loved it! It’s my new go-to pumpkin bread recipe. Thanks for sharing this great recipe. It is amazing tasting. So happy to hear you enjoyed the bread, Carolina! Thanks so much for stopping by and leaving your feedback! Hi Christina – I always use a 15-ounce can. I’ve never used a 13-ounce can, so I am not sure of the result. If you happen to give it a try, I’d love to know how it turns out. Thanks so much for stopping by. 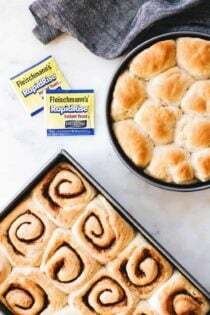 Easy to put together (even with my husband making breakfast, bacon and eggs in our small kitchen) Love the the Pumpkin pie spice mixture and the double loaf recipe. One to take to New Years potluck and one for home. I will try to use applesause/mixture next time. How much cooling time in pans would be helpful – I Googled and got 10 minutes so that’s what I did and worked perfect. Now to taste—>Yum!! We will do this again soon!! Really moist and a finch of crisp on the top! So happy to hear you enjoyed the bread, Randee! Thanks so much for stopping by and leaving your feedback!